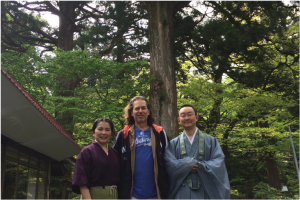 Retreat to Japan’s peaceful countryside and study advanced craniosacral therapy with Gary. Perched near the peak of western Honshu’s majestic Mt. Daisen – known as Japan’s second Mt. Fuji – the town of Daisen was once home to 100 temples, thousands of soldier-monks, and a centuries-old tradition of religious asceticism. Today the town is a popular for it’s beech forests, alpine meadows, and sparkling waterfalls. Daisen is located 4 hours outside of Kyoto Prefecture. You will be visiting Daisen Temple, which was founded in 718 and contains a rich history, and a museum of beautiful Japanese Art. You will also spend a day visiting Matsue, about an hour west of Mount Daisen. Matsue is the capital city of Shimane Prefecture, in Southwest Japan. Known as the “City of Water”, Matsue stands by the Sea of Japan where Lake Shinji and Nakaumi meet, in the middle of Shimane Peninsula. 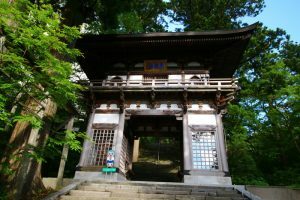 This city is also home to one of the most ancient and important Shinto Shrines in Japan, Izumo-taisha (出雲大社, Izumo Grand Shrine). At your temple guest house, you will experience compassionate care and wonderful heartwarming meals. Participants must secure their own flights to Japan and transportation to and from the airport. The closest airport to Mt Daisen is Yonago Kitaro Airport (YGJ). You will need to get a flight from Haneda International Airport (HND) to Yonago Kitaro Airport (YGJ). Please book your travel to arrive at Yonago Kitaro Airport (YGJ) on the morning of May 2nd. We recommend arriving early on May 2nd to have time to travel to Daisen, settle in and enjoy dinner with our group. We will arrange a taxi or shuttle or car from Yonago Airport to Daisen where you will be staying. Please provide your travel itinerary when you have booked your flights. The cost of transportation to and from the airport will be $20-$30 each way. Please bring cash to pay for the transportation fees. The last day of the Daisen Retreat is May 8th. If you are leaving Japan we recommend flying out of Yonago Kitaro Airport (YGJ). You may leave as early as the morning of May 8th. We recommend using ANA Airlines to book your travel. You can call 1-800-235-9262 or go to the website. *Includes taxes, fees and carrier-imposed charges.